Breitling CEO Georges Kern touched down in London recently to showcase his much anticipated new collection, named the Premier. Breitling have been very busy indeed since changing ownership some 18 months ago, and the initial results are impressive. The Premier line nods to Breitling’s original 1940’s model of the same name, but it has been sharpened up and modernised. It’s certainly not a lazy re-edition. The entry-level model, for example, is a smart-looking steel 40mm automatic version with a 6 o’clock sub-dial and Valjoux movement, all for a reasonable £3,600. They also have a 40mm day date version for the same price, before moving into what Breitling does best: chronographs. Included in this is a 42mm automatic chronograph from £4,950, as well as its trademark “panda dial” the 42 automatic chronograph, is complete with the Calibre 01 movement (Breitling’s in-house manufactured movement, which is noted for being seriously robust, as well as highly accurate), priced at £6,600. However, here at Ape, we’ve got our eyes on the Breitling for Bentley Chronograph. If we’re honest, the Bentley models had been running out of steam in recent years. They were a little chunky for our liking and not really in keeping with what a Bentley driver might actually wear. But this new version is a killer. 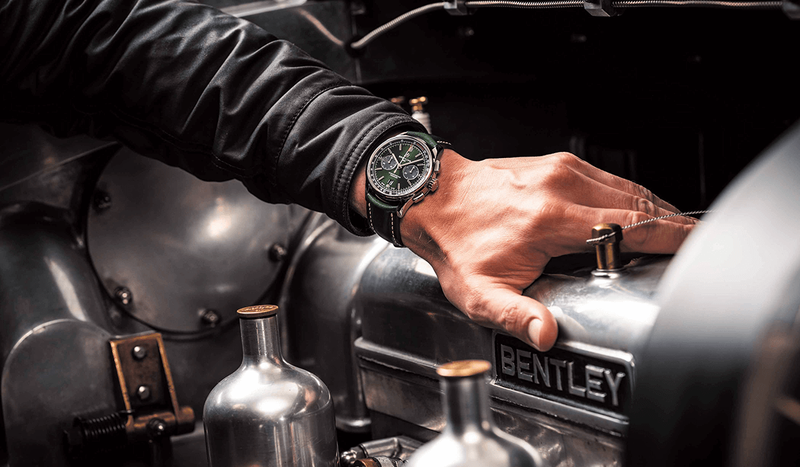 Featuring a British Racing Green dial and strap, it’s the type of watch you’d want on your wrist if you were purring down the M5 on the way to Goodwood in your Continental GT for a track day. It’s priced at around £7,000, so not cheap, but it got a big thumbs up from our watch editor. All in all, it looks like Breitling is back. Many will say the brand never went away. But whatever Mr Kern is doing, we like the results. The Premier collection is on sale at breitling.com now.